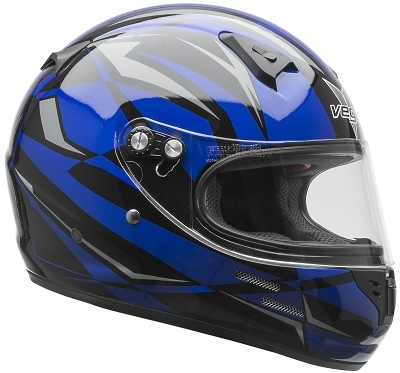 Vega's New KJ2 Jr. Karting Helmet is an ultrlight super comfortable youth karting helmet. Specifically designed with yound drivers in mind, the lower profile shell keeps the weight down while maintainging all the safety features of bulkier helmets. Strong shield latch and front push release ensures the shield will stay locked down until the driver opens it up. Super soft and comfortable liner ensures all day comfort. Available in 4 sizes, S-XL, to accomadate a wide range of young drivers. Q: Hello, you list this helmet as Snell cm2007 certified ut the Snell website lists only the arai CK-6S as cm2007. Please verify? A: Bryce, The KJ2's Snell certification is the latest for a Karting junior helmet and it's the same rating any other Karting junior helmet would get, Arai helmets are much more expensive but not because of the rating so much, but because Arai constructs their helmets with high end light materials, excellent and proven aerodynamics and top notch workmanship.